Well, our sailing sabbatical is finally coming to a end... After spending 6 months sailing "Hurulu" down the California and Mexican coasts, and then after crossing the Pacific as crew on the boat "Apple," we disembarked in Hiva Oa in the Marquesas...our final port of call reached by sailboat. The Marquesas are very cool-- a fellow sailor described it as "similar to Kauai 70 years ago" which is probably accurate. The islands are virtually unt ouched and undeveloped, and are little visited except by sailboat or the occasional dedicated tourist looking to get off the beaten path. Part of their appeal is that the Marquesas are the island group farthest from any continent in the world, lying between 550 and 725 miles south of the equator and 852 miles northeast of Tahiti. The other part of the appeal is that they are beautiful yet empty...these islands, which are lush, dramatic and green, have rich histories and were first settled by Polynesians around 100 BC. However, at present only about 8 thousand people in total live on all 14 of the isla nds, down from an estimated 100,000 in the 16th century (smallpox was widespread). Anyway, our stay there was brief; after a couple days in the town of Atuona, where we visited the Gauguin museum and had some nice hikes, we hopped a little puddle jumper airplane to Tahiti. (To orient our readers, "French Polynesia" includes several island chains, including the Society Islands such as Tahiti and Moorea, as well as the Marquesas, Tuamotus, and Austral Islands; Tahiti is the capital of them all). Our original plan was to hang out in Tahiti and island hop by ferry for four or five weeks until our friends on La Palapa showed up, but we had to curtail these ambitions as soon as we landed; we were in for quite a shock-- Tahiti and all of French Polynesia is unbelievably expensive. Really-- it is shocking what things cost over there. Nonetheless, we made the most of it, and took a ferry over to the island of Moorea. This is a beautiful volcanic island, ringed by a protective reef and the accompanying crystal clear turquoise lagoon. Here, we stayed at a beachfront place called "Camping Chez Nelson". We secured a tiny, bare bones hut, cooked many of our own meals in the communcal kitchen, and spent o ur days snorkeling, reading, and touring the island by scooter. There really isn't a whole lot more to do here...the tourist infrastructure has, by design, been kept pretty low key, and I'm sure the high cost has impeded massive tourism development as well. Speaking of the expense, it definitely impacted the experience a bit...we felt rather trapped since every taxi ride, activity, or meal out cost us an arm and a leg. The only "bargain" on the island-- which was found at nearly every restaurant-- was a burger and fries combo plate for about $9, apart from which the meals started around $25 on up (even for very basic lunches and dinners). After several days of burgers, we started to feel rather unhealthy-- similar to the lead guy in the movie "Super Size Me" (who eats nothing but McDonalds every day and chronicles how his body changes over time). Anyway, the islands really are incredibly beautiful-- "postcard perfect"-- and the islanders are among the most friendly I've encountered; they seem very happy with their lives, and very relaxed and content...we spent some time at the public beach, and the most popular activity is for 4-5 Polynesians to sit under the shade of a palm and sing along to a guitar/ukulele combo. Their lively songs-- mostly in Tahitian but with some pidgin English and French songs included too-- makes for great background music while beachcombing. Naomi: "Hello do you have a room for two people for tonight?" Naomi: "Ok, one moment; Let me pass you to my husband"
Nathan (speaking in English but with a very thick and dramatic French accent): "Ehh....Bonjour! Do jew have...ehh, un rhoom...fawr two...pee-puhl?" Pension owner: "Jess, we do! Jour name, si vouz plais?" Inevitably I just about cracked up laughing with each call, but I kid you not-- speaking English with a very bad, very overdone French accent actually worked! The people on the other end could, for the most part, understand me quite well (although somehow I doubt this would work in France). In Tahiti we bought Naomi some amazingly beautiful green pearls that match her green eyes at the Tahiti Pearl Market, and we ate dinner at the "roulottes", which is a collection of mobile food vans that all congregate down near the waterfront. Still not cheap-- I think we were averaging about $15 per plate-- but nice, fresh and tasty food, like seafood and steaks. We also spent half a day running around trying to find space on a cargo ship heading out to Bora Bora or Huahine, to no avail. Finally, after 2 weeks, we were "Tahiti-ed out" and caught a midnight flight to Oahu, Hawaii. We arrived at dawn and took a bus to our downtown hotel. Immediately we were hit with reverse culture shock...passing sign after sign advertising "2 eggs, 2 bacon, 2 sausage and french toast for $4.99" was exciting and disorienting. It may be hard to believe, but after the limited selection and absurd prices in French Polynesia, seeing the selection of food products available was a a dreamy beautiful thing. Indeed-- we spent the first two days just EATING our way through Waikiki...e.g., I started the day with the breakfast special referenced above, then had teriyaki stir fry for lunch, then an acai/fruit bowl for afternoon snack, then sushi for dinner, etc. This is contrary to my nature...in many ways I'm turned off by the rampant consumption and consumerism in the U.S., but when you've been away from it for awhile and living off stale pasta, a U.S. supermarket, 7-11, or food court is an amazing sight. Hawaii was a great middle-step 'decompression zone'...still island-y and tropical, but American enough that we started to get used to hearing English again, etc. Naomi's good friend Elbert had some free time and served as our unofficial (but very gracious) tour guide. We spent a day up on the North Shore at Waimea Bay swimming and exploring, then went to Duke's at sunset for cocktails. We also did some nice hiking to Manoa Falls and took some good swims with Elbert, who is training for a triathlon. And that...as they say...is that! Our sailing adventure is coming to a close. After a brief stay with our respective families, Naomi will return to SF to move us back into our apartment, and I will return to Puerto Vallarta to arrange delivery of our boat back to San Francisco. We will pick up our dog, we'll pick up our car, we'll re-start delivery of Netflix and the Wall Street Journal, and we'll basically pick up our lives where we left them six months ago, for the most part. Sure, it's going to be hard to get back to the grind... to go back to being productive members of society in the current economy. But we would do it all over again in a heartbeat. It's not often in life that we actually get to follow a dream and make it reality... so it feels very gratifying to have done so. And, for many years prior to this trip, I spent countless hours sitting in the comfort of the armchair, glass of vino at hand, reading about sailing to these places, it made it all the more special when we actually did sail to them... entered the palm-fringed bay, dropped the hook, and cracked open a cold cerveza... occasionally with a fresh-caught fish ready to grill. Sailing off into the horizon is never quite what you imagine, of course-- different, harder, grittier, saltier-- but almost always ultimately better. Thanks for reading our blog and following our adventures! Land Ho! We Sailed Across The World's Largest Ocean! We successfully sailed across the Pacific Ocean! Although it took some serious patience-- 22 days at sea on a small boat-- it was overall a safe and speedy voyage; We had some adventures and tribulations for sure, but no limbs lost to sharks and no knockdowns from rogue waves; we arrived intact. Day 1: Left Puerto Vallarta as crew on "Apple" at 10:30 am; Immediately saw huge whale breach 3x; Caught large dorado but he snapped the line; Everyone still getting their "sea legs" on (meaning we're all a little clumsy and a little queasy). Day 2: Fast passage-- this is a fast boat! Did 156 nautical miles in 24 hour period; Wind in 12-17 knots; Captain got seasick; Everyone sleeping alot, still getting used to sea motion. Day 3: Flew spinnaker for first time; played CD from fellow cruisers Hypnautical (they are musicians); NB hand-steered his night time watch; Winds mellowing slightly to 10-16 knots. 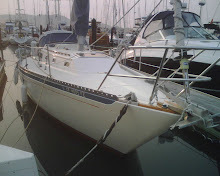 Day 4: Flew spinnaker but chafed through halyard and sock; Nightime, mostly becalmed, leading to "challenging" sailing (difficult to keep the sails from flogging); Lots of open time to think about a book idea called "Startup: An Owners Manual"; Made 111 miles in 24 hours. Day 5: Spinnaker halyard again chafing; Some dischord between captain and Naomi; Received first weatherfax from Hawaii; However, SSB radio does not seem to be working correctly. Day 6: Saw many dolphins! After sunset, we did 'squall avoidance practice' which quickly led to squall avoidance reality (squalls are short lived, violent thunderstorms that happen when the air cools after sunset). Day 7: Captain Mike not getting enough sleep so he changes up watch schedule, now 4 hours on, 8 off; 15 knots wind, choppy seas; More squalls after sunset, we use the radar to monitor them, like a video game. Day 8: Saw another ship for the first time (a cargo vessel); Boat is running out of power and fresh water rapidly-- moratorium on showers; Naomi's parent's called on satellite phone; Caught huge fish but it snapped the line, which wound up in the wind generator; Crossed the 1000 miles mark, had rum and coke. Day 9: Fixed wind generator; Apple the dog poops all over deck; Friendly 'debate' about number of miles made good in previous 24 hours (Nathan estimate: 134 vs. Captain's 247 nm); Further 'discussions' about power and water management. Day 10: Nice fast sailing under spinnaker; Closed down the forward head (bathroom); Veronika got out guitar; Nathan ate candy bars all day; Naomi made nice dinner; Rained a little; Everyone got along. Day 11: Halfway mark! Took showers for first time since day 5; Watch schedule moved around again; Nathan composed catchy little guitar ditty called "Log HO!" Day 12: Flew spinnaker all day; Saw large ship, probably a research vessel? Also saw lights of a ship at night; Everyone getting along well; Nathan made "english pub food" for dinner; Moon has gone, leaving us with "billions and billions of stars". Day 13: Flew spinnaker half the day, then trade winds suddenly shifted direction to come from SSE...could it be we were through the ICTZ (doldrums)? Flew along at 8.5 knots for the next 18 hours, very encouraging; Nathan hand steered his night watch, saw 2 shooting stars and caught one flying fish; Everyone getting along well; Saw Southern Cross constellation for first time. Day 14: Captain wanting us to hand steer, which is a bit of a 'sticking issue' (very tiring when you have 8 hours on the helm each day); Overall, good wind and smooth seas. Day 15: Turns out, NO-- we are not through the doldrums. Wind dies down to almost nothing, seas flat, cloudless sky; With swells running, sails just "whap" back and forth, very maddening; But, major highlight-- we crossed the equator on Naomi's watch in middle of the night, woo ho o! We had champagne and made toasts to Poseidon and Neptune, and we officially became "Shellbacks"; NB made sushi and stirfry for dinner. Day 16: Still in doldrums, flat calm water-- very peaceful and would be enjoyable if we weren't still 1000 miles from land; In morning, we spot sailing vessel "Hypnautical" and with spinnaker flying, we cruise by; Nathan dove in after diesel funnel and deck brush that was sinking...swimming out in middle of ocean is oddly unnerving, it's so empty flat and blue. Day 18: Somewhat choppy seas, but under 500 miles to go! Sailed close hauled most of the day; Water is turned off-- we're under strict rations; Some 'discrepancies' between rules and to whom they apply, but...what can you do? However, NB's night time watch is near-perfect...8-10 knots of wind, nice warm night, no helm attention needed, so NB finished reading "Mutiny on the Bounty". Day 19: Calm seas, good wind, very nice sailing all day. Everyone getting along. During night watch, wind became erratic; Naomi and Veronika had squalls virtually all night. Day 20: Nate had very nice morning watch-- 7 knots boat speed on 10-12 knots wind; Rocked out to Neil Young's "Unkown Legend". Made massive cheese, salami, hummus plate. Hiand steered the night watch, with winds continuing strong all day and night, with moderately choppy seas. Probably our record day: 167 nm! Day 21: Good wind continues! Under 100 miles to go, which is somewhat hard to believe. We're flying along--- actually, we are going too fast and will likely arrive in the nighttime (which is a no-no). We reduced sail to triple reefed main so we don't go in an night. Some 'boat tensions' running high...good thing we're so close! Day 22: Land Ho! Arrive! We motored into the bay at Hiva Oa right at sunrise. The smell of the land was intoxicating...a blend of bougainvilla, citrus, and soil. Anchored bow and stern in the bay, which is bordered by steep dramatic green cliffs. Nate and Naomi got off boat, walked on land on wobbly legs indeed! Walked around the tiny town of Atuona (pop 1300) then back at sunset...3 other friendly boats had arrived! Big party on the catamaran Carinthia, with crews from Bravado, Hypnautical, Loveso ng, etc...Flor de canha rum flowing smoothly...Naomi and I get toasted and cheered by everyone from all the boats....fun night! Ok, that's the daily log; but what was it really like? To be certain, it was different than we had expected. On the plus side, the actual passage was easier than we thought it'd be. The sailing was quite nice, with wind most days in the 8 to 15 knot range-- steady trade wind conditions-- and we ticked off the miles. Further, we fell into a pretty rigorous daily routine-- wake up, brew a coffee, go on watch for 4 hours, have lunch, do an hour or so of boat chores, read during the afternoon, have a communal dinner, nap briefly until nighttime watch, and then sleep. Repeat pattern. This structure made the days fly by, and there weren't many dull moments. On the other hand-- there's no way to sugarcoat it-- it was a darn long sail. As much as I love sailing, the reality is we were on a small boat in constant motion for three weeks. We only paused once, when becalmed near the equator, to go for a swim. The rest of the time, life was lived at an angle (as the boat heeled) or occasionally, with the boat flying around in multiple directions (during the 3-4 days when the seas were choppy). But other highlights made up for the "challenges." For example, in 22 days we only saw 3 other ships. With 6 billion souls on this planet, it was pretty amazing to be truly "out in the middle of nowhere" with nothing and no one for as far as the eye can see...such emptiness and isolation is rare, and in my opinion, pretty cool. Another highlight was the night time watches, when everyone else would be asleep, and it was just me and the boat under billions and billions of stars. It really does take getting out there away from all light sources to appreciate this. We had a book of constellations, and each night I was able to recognize a few more patterns...Southern Cross, Taurus, Draco, Cepheus, etc. Later on, I learned a few of the constellations used by early Polynesians to navigate between Tahiti, Hawaii, Samoa, etc.